By Day: A ski-plane flight from Yellowknife, Blachford’s location is ideal for Aurora Borealis viewing. While you wait for the sun to go down, cross-country ski or snowshoe along 20 km of trail, dogsled along the lake, learn about Dene culture or start-up a game of hockey or curling on the ice. By Night: Perfectly positioned on a steep hillside overlooking the lake, the lodge is set up for Northern Lights viewing — watch from the hot tub, viewing deck or through the lodge’s grand windows. Bright guestrooms in the main lodge and nearby cabins share washrooms and showers. All trips include meals, served in the timber-frame main lodge. Directions: A one-hour flight east of Yellowknife, on Blachford Lake. By Day: Long-known for its spectacular summer and fall hiking, Lake O’Hara’s open forest, imposing glaciers and towering peaks are just as magical in winter, but far less well known. The towering Continental Divide, just west of Lake Louise, rings the last of the snow out of the storms, coating the area in enough powder for excellent beginner and intermediate ski touring and snowshoeing. But first you have to get there via an 11-km ski or hike up the packed access road. From there, the lodge’s guides lead tours onto the Opabin Glacier, into cirques beneath the cliffs of Mount Hungabee and Lefroy and to snowy passes and viewpoints. Track up the pristine canvas of lakes and meadows or work up an appetite by cross-country skiing the access road. By Night: The main lodge is open from February until early April and is a cozy and social place to hang out after a day in the snow. Rooms are simple, but well equipped with showers and bathrooms. And the food… it’s almost as delicious as the scenery is grand. Many nights end with Scotch tasting, a sweat in the sauna, or both. Directions: Park a few minutes west of the BC-Alberta border, 15 minutes from Lake Louise, just off the Trans Canada Highway. By Day: Located on the southern edge of Ontario’s beloved Algonquin Provincial Park, this lodge maintains 60 km of ski trails — some groomed, some just marked — that snake deep into a rarely visited part of the park. For snowshoers, three dedicated routes stay closer to the lodge. Watch for resident wolf-pack tracks on all routes. 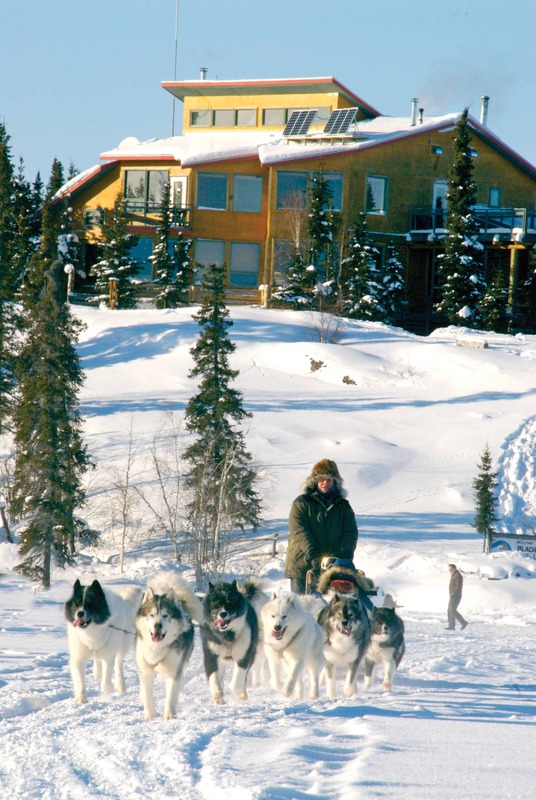 You can also dogsled on day-long and multi-day trips, explore with a GPS and snowshoes, get polar with a dip in the lake and, in the springtime, help to harvest maple syrup. By Night: So secluded it requires a 25-minute ski to reach, the award-winning eco-lodge is not only off the grid but out of cellphone range too. A micro-hydro system powers the lights in the two lodges — the main lodge has 12 simple bedrooms, a kitchen and common area and the sleep-cabin has five additional rooms. The power system also warms the water in the shared showers and the electric hot tub (the only carbon neutral tub in Ontario). Directions: Jumping-off point is located three hours northeast of Toronto, near Bancroft.